Abstract: Based on Jones & Bartlett Learning's acclaimed 100 Questions & Answers series, 20 Questions and Answers about Metastatic Castration-Resistant Prostate Cancer (mCRCP) provides authoritative and practical answers to the most common questions asked by men who have been diagnosed with prostate cancer which has proven to be resistant to initial therapies. Providing both doctor and patient perspectives, this easy-to-read book is a comprehensive guide to metastatic castration resistant prostate cancer, and is must-have for patients as well as their caregivers. 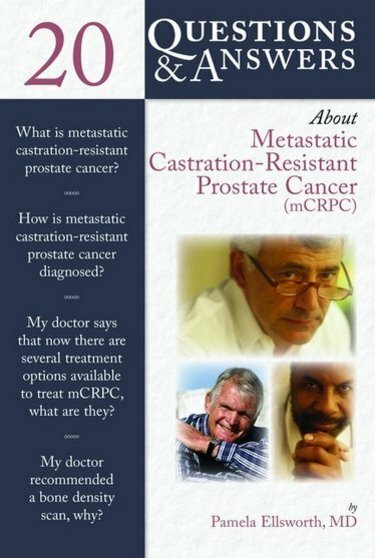 Written by Dr. Pamela Ellsworth, a prominent urologist and best-selling author, 20 Questions and Answers about Metastatic Castration-Resistant Prostate Cancer (mCRCP) is an invaluable resource for anyone who has been impacted by prostate cancer.